The campaign by the Scotland-UK Coalition of Unionist Propagandists (SUKCUP) to discredit the Scottish Government for its compassionate release of Mohmed Al-Megrahi continues apace. First we had The Herald telling us that the whisky industry would collapse as a result. Then we had Glen Campbell's BBC Scotland coverage of the release exposed as partisan and rabidly anti-SNP. Continuing the pattern, last week The Scotsman ran with this piece on Scottish Justice Minister Kenny MacAskill. Apparently, his criticism of Labour hypocrisy on the matter was somehow deemed to be taunting the families of the Lockerbie dead. The Sun would be proud. Think about what this last one means. Somewhere in The Scotsman offices there is a journalist with a computer spreadsheet listing all the prisoners released on compassionate grounds from Scottish prisons, alongside the number of days since they were released. Each time one of them dies, Al-Megrahi moves up the list and this journalist punches the air and shouts ‘Yes!’, exchanging ecstatic thumbs-up with his boss in the corner. The SUKCUP minions are now praying he lives as long as possible, if only to prove the Scottish government was incompetent in its decision to release him. Preferably not long enough to clear his name, but maybe just till the referendum, when his on-going ability to breathe will no doubt be useful as an argument against independence. This continuing campaign on Al-Megrahi got me wondering. Given all these dire predictions about what would happen to us as a result of the release, just how has the decision affected Scotland? First, and contrary to widespread expectations, it would appear not to have led to US carpet-bombing of Scotland with B52s after all. Nor, apart from the FoxNews whack-job minority, has it led to much animosity towards Scotland in the US. In fact Susan Boyle seems to be doing just fine. Nor indeed has it led to a US boycott of Scottish goods. Luckily, no one knows the oil is ours. (Just think how much we would have lost if it were. Whew.) Similarly, our salmon is still in huge demand, and Scotch whisky sales have not plummeted. Considering that the majority of export whisky sales are to non-US markets – with France our biggest customer and China our fastest growing market – this should come as no surprise. Not that business should have anything to do with such matters. Those worried about the whisky industry should be more concerned about London-based multinationals closing their Scottish whisky plants. The whole Diageo saga - and many others like it - might have been averted had Scotland been independent and able to offer concrete tax benefits for corporations to remain in Scotland. But I digress. The point is this: not one of the their predictions has come to pass, and yet it continues. If it wasn’t clear before it should be now: the distress the SUKCUP flunkies felt most about Al-Megrahi’s release was not that the Scottish Government made a bad call and released a convicted bomber, nor that it didn’t do as the White House demanded and let him rot, not even that it forced UK Labour’s Scottish branch into mental contortions as it condemned what its London masters secretly desired in order to close Tony Blair's dodgy deal in the desert. As we knew all along, the true source of their discomfort was the fact that the decision was left to Scotland at all. Once you understand this thinking it all makes sense. You realise that had the decision gone the other way, we would now be getting regular updates on the health of a dying man in Greenock Prison, the Scottish Government would have been portrayed as callous Presbyterians lacking in compassion, but simultaneously labelled as weak for having caved into US pressure to keep him locked up. That’s the problem with the Scottish Unionist media: they’ve forgotten how to think for themselves. Servitude and obsequious grovelling to London, combined with knee-jerk opposition to everything the Scottish Government does solves every problem. What these gits don’t get is that fewer and fewer people are listening. If the answer to everything is simply ‘it's the nationalist government of Scotland wot did it,’ people anticipate what you’re going to say before you open your mouth, compensate in advance and work it out for themselves. It's not working any more. 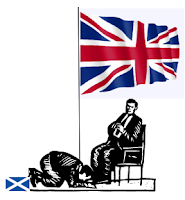 Coming soon: the Federal UK Coalition of Unionist Patriots.